Universe had mixture of hydrogen, helium - Solar System Planets And Moons Section. Universe had mixture of hydrogen, helium. 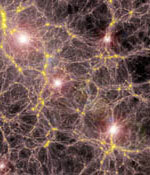 Early universe only had a mixture of hydrogen, helium and other lighter elements. Early Supernovae Seeded the Universe With Elements. Sep 19, 2003 According to cosmologists, the early universe only had a mixture of hydrogen, helium and other lighter elements, but none of the heaver elements required for life - like carbon. From the original gasses, giant stars formed - some were 200 times larger than our Sun - lived for a brief time, often just a few million years. These giant stars converted up to 50% of their material into heaver elements, mostly iron, before exploding violently as supernovae. The James Webb telescope, due for launch after 2011 will be so sensitive it should be able to look back to watch these supernovae happening. Sep 19, 2003 The launch date for the European Space Agency's SMART-1 spacecraft has been set for early morning of September 28. Earlier this week the spacecraft was attached to the top of an Ariane 5 rocket at the Kourou spaceport in French Guiana. When it finally does get into space, SMART-1 will use its ion engine to slowly spiral away from the Earth until it gets captured by the gravity of the Moon. Once its in orbit around the Moon, it will map the chemical composition of the surface with greater detail than ever done before. It will also search for evidence of water ice at the Moon's south pole.